The third film from Miwa Nishikawa, whose previous film Sway swept many domestic film awards and garnered attention at the Cannes film festival. A novel she herself wrote, bated on the idea of this film, was nominated for the Naoki Prize. This sincere, humanistic drama takes a scalpel to the timely theme of rural medical treatment against a beautiful pastoral backdrop. 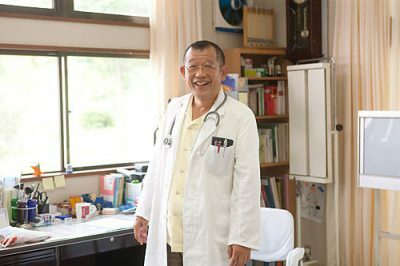 Rakugo storyteller Tsurube Shofukutei, who has branched out into acting in recent years, gives a highly empathetic performance in his first lead role, as a doctor beloved by the village residents he treats. A small mountain village. Its sole and beloved doctor Ino (Shofukutei) suddenly vanises. An investigation gets underway but nobody, including medical intern Keisuke Soma (Eita) who had arrived in town two months prior, has any idea of Ino’s true identity. Just before disappearing, Dr. Ino had examined a widow named Kazuko (Kaoru Yachigusa). Upon learning of her terminal condition, Kazuko beseeched Ino to lie about it, but before long Ino’s own secret was exposed.